In honor of Christmas, I have decided to let my youngest sister share her short story today. 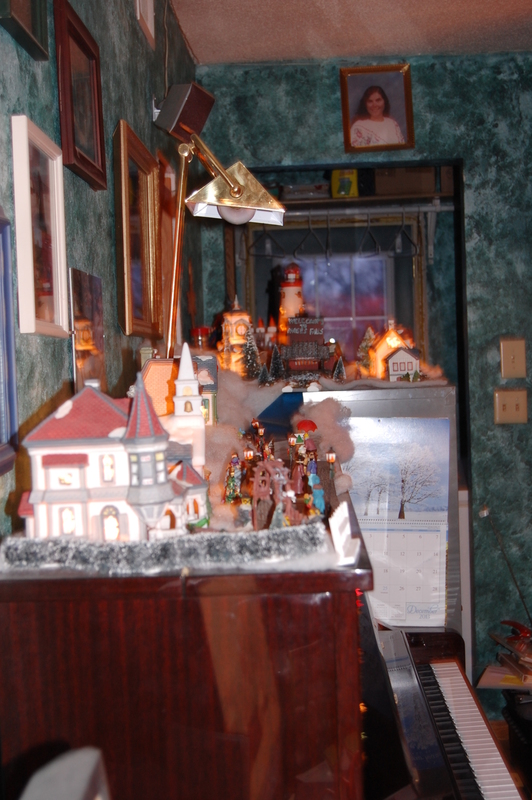 The story was written about the village Mom puts up every Christmas. Enjoy and have a very Merry Christmas!! 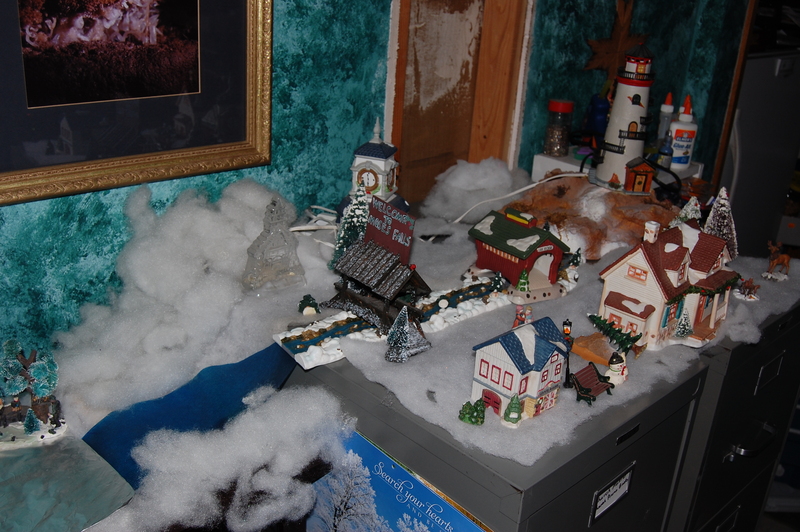 It is the afternoon of Christmas Eve in the busy village of Moses Falls. To begin my little story, I must explain the curious origin of the name of the quaint little village. You see, at the top of a very large hill is a huge boulder, and out of this rock, seemingly from nowhere, comes a small, clear, waterfall. Of course, at the moment the frozen waterfall is now a beautiful backdrop to a large ice-skating rink. According to the story, the founders of the town came upon the little waterfall in a small clearing in the woods. They were at the top of the hill close to the waterfall, and it was very obvious that the source of the water was from the rock. The woman immediately took it to heart, and after repenting and asking forgiveness from God and those about her, they held a little meeting and decided to found a town at this very spot and named it Moses Falls. Today, however, I don’t think anyone in particular is thinking about the name of their town. I am preparing to go out into the comfortable wintry weather to walk through the busy street. The village only has one street through a short row of houses and small shops. On this one street there is only one row of buildings, and on the other is a huge field of snow that has an occasional farmhouse in the distance. We will only comment on the row of town buildings. As I exit my little boarding house, I notice a large and imposing mansion, which I am told by my hostess is owned by “a grouchy, stuffy old gentleman with his poor dear young granddaughter Alison, who has just turned the courting age.” The hedge on each side of the arched gateway seems to give the whole house a private and enclosed feeling. The large church is adjoining to this mansion, and is a very tall and inviting building to my judgment. The bell in the steeple will toll for the 8:00 Christmas Eve service, and in the meantime a musical duet of a violin and French horn practice beside the brightly lit walls and snow-covered eaves. In front of this scene, a father and son hang a wreath on the lamppost and a mother pushes her infant in a covered perambulator while a toddler tags along beside her. A good lady from the church is buying a bouquet from the street florist just in front of the Olde World Curiosity Shop while two children trot slowly past on a pony led by their parents, and the owner of the store sweeps the little pathway leading inside. An intense checker game is in progress outside the Rare Book store. The competitor’s every move is intently watched by an older gentleman standing and stroking his chin thoughtfully. Unknown to these good men, a pair of boys is preparing –with the help of a frisky pup- to sled down a hill just beside and precariously near the checkerboard. But worse yet for the mischievous boys, a mother is strolling behind her crippled daughter’s wheelchair as it slides smoothly on runners, directly into the path of the sled. We depart from this explosive situation to find a young widow constructing little woven baskets beside a bench. She wears a red woolen dress and blue plaid apron with a little white kerchief around her head. To her left and slightly behind her is a bake sale in front of McMahon’s General store and the US post office. The of the bake sale look and smell inviting, and I have just decided to buy a small roll, when a feminine laughing screech startles me and I turn quickly toward the ice skating rink, where the sound issued forth. There I see a small accident; a young man is sprawled in the center of the ice rink while a young lady who obviously knows very little of skating is headed straight toward him as he struggles to get up. Two other young men laugh and circle, one catching the girl by the arm and steering her safely round the fallen, while the other helps the unfortunate up off the ice. As I sigh with relief, I notice an older gentleman sitting in front of an easel painting beneath a red umbrella. He seems to be capturing on his canvas the heartwarming scene of a father and son ice fishing beneath a cluster of large and small trees. One large oak has a sign that reads “Ice Fishing”. I quicken my pace a bit to go up the steep hill beside the frozen waterfall. There is a shoveled path that leads to a wooden bridge that connects the old part of town to the new below. A butcher shop is directly in front of me as I exit the covered bridge, and close beside it are two young ladies in their yard feeding chickens. A large clock tower, visible even in the town below, is behind the ladies and a small house with a porch, which also has its own bridge leading to the tower. I presume that this is the house where the clock tower keeper lives. Atop the huge boulder I already mentioned as the source of the waterfall is a tall and majestic lighthouse with a glowing red light. A tree is below it and there I find my gaze captivated by the sight of a small bull moose looking me square in the eye, and between us a stump where two squirrels play. As the moose turns slowly away, I realize that my path too, must turn back to the village below me where the bell of the church of Moses Falls will soon toll for the Christmas Eve service. The sun is now setting and I must go back to my little boarding house and have a quiet dinner before the service. In the meantime, I wish you all a pleasant and very joyous Christmas Eve in the true spirit of the One who came this night. Good question, Miss Effy. 🙂 The way I heard it, it took just over a day to write the first draft, but few more days to make the edits. You’re welcome!